Plants densely cespitose, upper portion dense, obovate to obpyramidal. Culms 60-250 cm; internodes not glaucous. Sheaths smooth; ligules 0.6-1 mm; blades 20-70 cm long, 2-7 mm wide, usually glabrous or scabrous on the margins. 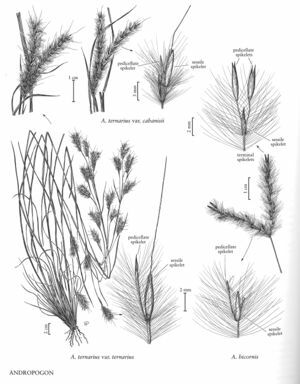 Inflorescence units 50-500; subtending sheaths 2.5-4.5 cm long, 2-3 mm wide; peduncles 20-70 mm, with 2(3) rames; rames 2-4 cm, exerted at maturity; internodes filiform, densely and evenly pubescent, hairs 3-9 mm. Sessile spikelets 3-4 mm; unawned; callus hairs 0.5-1 mm; keels of lower glumes scabrous above the midpoint; anthers 3, 1-1.4 mm. Pedicellate spikelets mostly vestigial or absent, 1-2 of those in the terminal units on each rame 3-5 mm and staminate. 2n = 60, 120.